It took me a day in Gangtok to organize all the requisite permits to visit Nathula through a local tourism agency. Gangtok is located at about 6,000 feet and the drive to Nathula is 2-3 hours long depending on traffic and weather conditions. While in Gangtok, I stayed at the guest house of the Indian Reserve Battalion, courtesy the local commandant who knows my friend in Darjeeling. On the appointed day, we set off sharp at 7 a.m. and began the steep climb to Nathula. 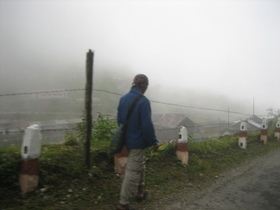 On our way, we found many locals hitchhiking their way up to the villages along the road to Nathula. 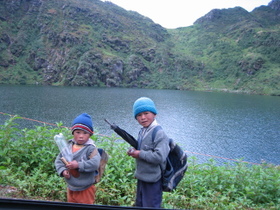 We picked up a couple of school kids who were walking to Tchangu lake to get to class. The school house is located at 12,000 feet! We made our first stop at Changu lake, one of the highest lakes in the world at 12,000 feet. 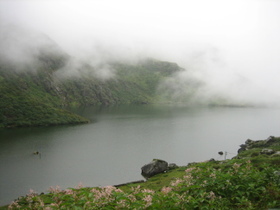 Tchangu lake had an ethereal serene quality to it with a mist haning over it. It is considered holy by the locals. There we met this 80 year old grandma at a tea stall. As I approached her to request to pose for a pic, she gestured that she was hard of hearing. So I leaned over and shouted in her ear in Hindi for a picture. 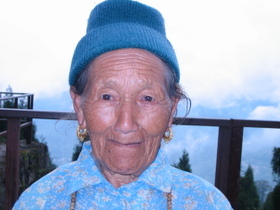 She went livid and started yelling at me in Nepalese. I felt deeply embarassed that I had offended her. Then she just cracked up laughing loudly pointing at my startled expression. The villagers surrounding us were in splits as they explained to me I had just experienced Grandma's special sense of humor. Apparently, she has perfect hearing. 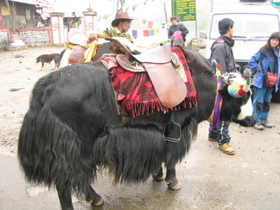 There are yaks in this part of the world and I spotted several of them along the way. 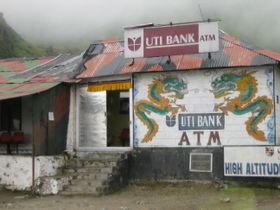 This ATM (UTI Bank) is located at 10,000 feet. It services the border security personnel in the area.